It is not uncommon for daughters of narcissistic parents to date and marry narcissistic men repeatedly. Unfortunately, people who come from healthy families cannot understand why this would happen to someone. Often times, a woman who has been in an abusive relationship more than once is considered “crazy” or “damaged goods” or people believe she is lying or exaggerating. This really unfair and frustrating when false assumptions are being tossed around about women who aren’t any of those bad things! It’s common for children from abusive homes to repeat cycles. We live what we have learned, and sometimes we don’t know what is wrong until we’ve experienced the cycle a few times and begin to learn and grow. Sometimes a therapist or a friend has to tell us. Sometimes we read it in a book and suddenly have a light bulb moment. But, you can’t fault someone who has never learned what is wrong for not knowing. I can look at my life and know why I have been so attractive to abusers and have scared off men with healthy boundaries, but I didn’t know it without time, experiences and wisdom gained through living. There was little to no love in my childhood. My dad was my favorite parent until he remarried and began to ignore me. Once he replaced me with a new family, he didn’t care that I existed. So I was stuck with my mother the narcissist who was always wanting to gamble or chase married men. She was rarely home and when she was, she was abusive. I wanted OUT of that home. I wanted to be part of a real family. I was also very, very shy, so it was hard to meet people and let them see my real personality. All people saw was a scared girl who froze up and had nothing to say. So, when someone did want to date me, I didn’t stop to wonder if I wanted to date them! When you have grown up with no love or examples of healthy relationships, it’s hard to know what one looks like. 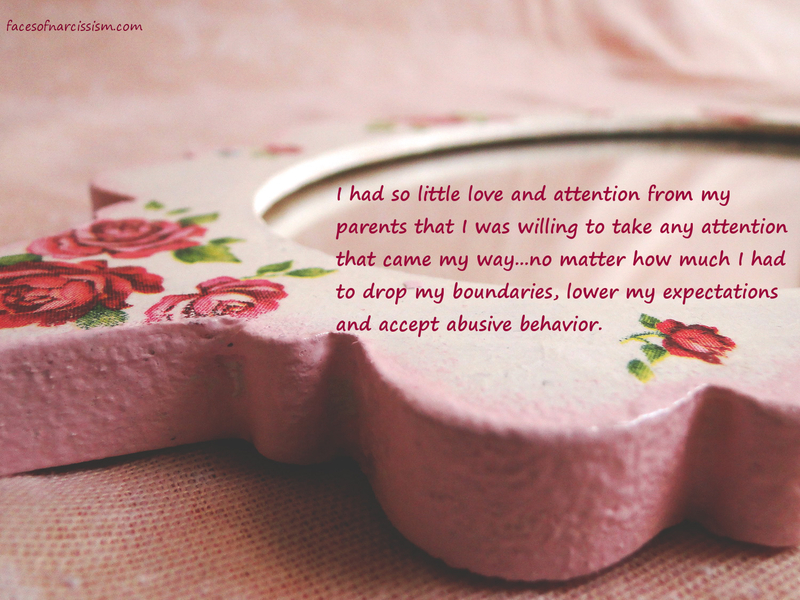 For me, abuse was normal, so when men were abusive, I figured that was just part of learning to compromise and accept others. I thought I would be petty or selfish to break up with someone if they were “just” yelling, screaming, name-calling…. In reality, that would have been the best thing to do. Fortunately, I have learned a lot about what to accept, what not to accept, and people who can and cannot change. But, I still find myself willing to date people that I’m not really interested in just because I feel bad saying “no,” or I feel like I owe someone a chance so I can see what they are like. It’s a hard habit to break. This blog was very informative. I find that when I am dating a narcissist there is an “at home” feeling of comfort, because it is familiar. When a man is actually nice and considerate, it feels strange and awkward. I often wonder what is wrong with him if he likes me. I am an ex-beauty pageant winner, so there is really no reason why they would not like me…physically. When I was young, perhaps our of jealousy, my mother stressed that I should have no ego, because people would think I was conceited. I was FAR from conceited, and had almost no healthy ego. All accomplishments were ignored, diminished or condemned. For example, when I entered the national beauty pageant, my mother said, “Why are you doing this, you don’t need this. You’re better than this. She did not come to the state pageant, but stayed home and watched on TV. I had the highest GPA in my graduating class amongst females, and all she had to say when I told her was to ask who had a higher GPA. Nothing was good enough. My sister was held upas the golden child, despite the fact that she did not accomplish what I did. She chose the ultimate lifestyle – she became just like my mother. After caring for my mother when she was dying, without my sister’s help, and as my mother lay dying in the hospital, when my sister finally arrived my step-father hugged her and said, “You were always her favorite child.” That was my light bulb moment. There was NOTHING I could have done to win her love and admiration. What little love she was able to give to another was all given to my sister. I wasted my life trying to impress an emotionally dead person. I also concur on the point that other people think there is something wrong with you when you have been the scapegoat and continue to date abusive men. They don’t understand that your parent(s) encourage you to be in defeating situations. They don’t want yo to succeed, because your job is to be the eternal “f**k-up..” Only when you fail do they even pay attention to you. People wonder why you don’t stand up to people and take care of yourself. It is because you were never taught to do this, never allowed, and always punished for these healthy actions. The tools you need to overcome the abuse were never there to begin with.